When I added the Duplicate command in Default Folder X 4.6.5, I took the opportunity to update the command keys to follow what Apple currently does in the OS X Finder. In the Finder, cmd-shift-D goes to the Desktop and cmd-D is used for the Duplicate command. Everyone will want things to be consistent between the Finder and the Open/Save dialogs, right? We’ve gotten a lot of hate mail from Default Folder X users in the last 24 hours, asking (with various levels of politeness) why we changed their workflow. Umm – cohesiveness of user interface? OK, maybe not, then. Since this change has made a lot of people angry, I’ve removed cmd-D from the duplicate command and made it so both cmd-D and cmd-shift-D take you to the Desktop, and re-released Default Folder X 4.6.5. To get this change, just re-download Default Folder X and reinstall it. For those of you that actually want command-D to invoke the Duplicate command like it does in the Finder, you’re going to have to suffer with a little dissonance in your user experience. Sorry about that. 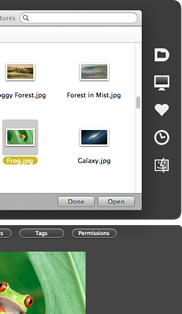 Default Folder X 4.6.5 is now available, giving you the ability to save a copy of a file while you’re in an Open dialog. It’s great for creating a backup copy of a document before you open it. This update also resolves some pesky issues, the most important of which is a fix for a problem with OmniOutliner 4. Default Folder X would sometimes make OO4 freeze for 2 minutes when you saved or exported a file. This version also works around a Mavericks bug that could make Default Folder X’s Spotlight and Preview windows pop up in the middle of the screen instead of below the file dialog where they’re supposed to be. There are a number of other smaller fixes and improvements as well – you can read about all of them and download the update from the Default Folder X Release page.